AQS author Anita Shackelford will be the cover quilter and featured artist in the March issue of Machine Quilting Unlimited. 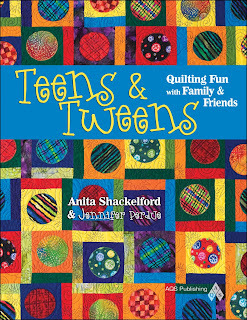 There will be a sidebar about quilting with kids, a great tie-in for her recent book with co-author (and daughter) Jennifer Perdue: Teens ‘n Tweens: Quilting Fun with Family and Friends. In the March/April issue of Quilter’s Home, Anita, Jen, and Jen’s daughter, Amber, will appear in a story about multi-generational quilting. Keeping quilting alive for the future! That’s great news for everyone! Rock on, ladies! AQS# 8026 at www.americanquilter.com or 1-800-626-5420.